본 발명은 셋톱박스 액션 로그 시스템 및 액션 로그 생성 방법에 관한 것으로, 보다 자세하게는 셋톱박스에서 운영되는 셋톱박스 애플리케이션에 대한 셋톱박스 이용자의 액션 로그를 생성/수집하고 분석하기 위한 시스템 및 액션 로그 생성 방법에 관한 것이다. The present invention is a set-top box relates to the action log systems, and action log generation method, and more particularly, Generation of a set-top box user's action log create / acquire and to analyze the system and the action log of the set-top box application that runs from the set-top box relate to. 따라서, 본 발명의 셋톱박스 액션 로그 시스템 및 액션 로그 생성 방법은 다양한 형태의 셋톱박스 애플리케이션에서 발생하는 액션 로그를 생성/수집/분석할 수 있어 사용자의 프라이버시 문제를 야기하지 않는 범위내에서 액션 로그를 생성하고 수집할 수 있고, 수집된 데이터를 분석하여 액션 분석 정보를 생성할 수 있으며, 이를 활용하여 셋톱박스 애플리케이션의 이용 형태에 대한 분석을 포함함으로써 셋톱박스 애플리케이션 내부에서 이용자가 사용하는 세부 컨텐츠에 대한 정보를 분석할 수 있는 장점이 있으며, 이를 통해 셋톱박스 제작자 뿐만 아니라 셋톱박스에 컨텐츠를 제공하는 컨텐츠 제공업자에게 세부 컨텐츠 정보를 제공함으로써 셋톱박스 이용자에게 효율적인 서비스를 제공할 수 있는 효과가 있다. Thus, the set-top box action log systems, and action log generation method of the present invention generates an action log in can generate / collect / analyze the action log that occur in various types of set-top box application that does not cause the user's privacy issues range and it is possible to collect, to analyze the collected data may generate the action analysis information, to take advantage of this information on the details of the user in the internal set-top box application content by including an analysis of the utilization form of the set-top box application the benefits that can be analyzed, and it is capable of providing an efficient service to this set-top box users by providing detailed content information to content providers who provide content to the set-top box, as well as a set-top box makers through effect. 도 1은 종래의 셋톱박스 로그 저장을 위한 소프트웨어 구성을 나타내는 블록도이다. 1 is a block diagram showing a software configuration for a conventional set-top box log storage. 도 2는 본 발명에 따른 셋톱박스 액션 로그 시스템을 나타내는 구성도이다. 2 is a block diagram showing a set-top box action log The system according to the present invention. 도 3은 본 발명에 따른 셋톱박스 액션 로그 생성 방법을 나타내는 흐름도이다. Figure 3 is a flow diagram illustrating a set-top box generates action log The process according to the invention. 도 5는 본 발명에 따른 로그 생성 정책 전송을 나타내는 흐름도이다. Figure 5 is a flow diagram illustrating a log generation policy transmitted in accordance with the present invention. 도 6은 본 발명에 따른 로그 전송을 나타내는 흐름도이다. 6 is a flowchart showing the log transfer according to the invention. 디지털 TV의 핵심 구성 요소중의 하나인 셋톱박스(Settop Box)는 다양한 셋톱박스 애플리케이션(Settop Box Application)이 동작되어 디지털 TV를 이용한 서비스를 제공한다. A set-top box (Settop Box) One of the key components of a digital TV set-top boxes is operating a variety of applications (Settop Box Application) to provide services using digital TV. 셋톱박스를 사용하는 이용자는 셋톱박스의 애플리케이션을 이용하여 EPG(Electronic Program Guide)를 사용하여 디지털 TV에서 제공되는 채널을 선택하거나, 셋톱박스의 기능에 따라 게임/인터넷 서비스를 포함한 여러 서비스를 이용한다. Users that use a set-top box uses a variety of services including a games / internet services, depending on the set-top box, select a channel, which is available on digital TV using (Electronic Program Guide) EPG using the application of set-top boxes. 프로그램 로직(Logic)이 탑재되어 디지털 TV의 서비스를 제어하는 셋톱박스는 일종의 변형된 개인용 컴퓨터와 같은 개념으로, 셋톱박스를 사용하는 이용자의 셋톱박스 애플리케이션 운영 방법은 기존의 개인용 컴퓨터에서 키보드와 마우스의 체계를 따르는 것이 아니라, 셋톱박스에서 제공하는 이용자 인터페이스 중 대부분 리모컨 또는 단순한 키패드를 이용해서 서비스를 받게 된다. The program logic (Logic), keyboard and mouse set-top box with the same concept as a kind of a modified personal computers, set-top box applications operating method of a user using a set-top box, which is equipped with control services for digital TV from traditional personal computers rather than follow the system, you get the service using the most simple remote control or keypad user interface provided by the set-top box. 따라서, 셋톱박스에서 이용자의 입력을 받는 인터페이스 장치나 인터페이스를 통해 행해지는 셋톱박스 이용자의 행태를 고려할 때, 셋톱박스는 기존의 컴퓨터에서 사용하는 키보드와 마우스의 체계를 뛰어 넘는 새로운 체계의 이용자 인터페이스 및 셋톱박스 애플리케이션의 형태를 요구하고 있다. Therefore, when considering conducted the behavior of a set-top box users via the receiving input from a user interface device or interface from set-top boxes, set-top box user interface of the new system goes beyond the framework of a keyboard and mouse to use the existing computer and It requires the form of a set-top box applications. 셋톱박스 애플리케이션의 기능은 셋톱박스에서 제공하는 리모콘을 포함한 사용자 입력 장치를 보다 쉬운 방법으로 셋톱박스 이용자가 애플리케이션을 사용할 수 있도록 여러 다양한 방법을 통해 구현되고 있다. Function of the set-top box application may be implemented in several different ways so that the user input device including the remote control provided by the set-top box in an easier way the set-top box user to use the application. 이러한 환경 하에서 이용자들이 다양한 디지털 TV의 서비스를 제공 받기 위해 리모컨이나 키패드를 작동하는 순간 동작되는 셋톱박스 애플리케이션의 로그를 생성/수집하고, 셋톱박스 이용자의 사용 패턴을 축적하여 분석할 수 있는 방법이 필요하게 되었다. To get users to provide services in a wide range of digital TV under these circumstances need a way to create / collect logs from a set-top box applications that moment motion to operate the remote control or keypad, and analyzed by accumulating the usage patterns of a set-top box users It was. 일반 컴퓨터를 중심으로 하는 애플리케이션은 다양한 형태의 로그 생성/수집/분석 체계가 존재한다. Applications around a common computer, there are various types of log generation / collection / analysis system. 그러나, 셋톱박스는 컴퓨터와 달리 하드웨어적으로 제한된 성능을 가진 부품으로 구성되어 있다. However, the set-top box is composed of hardware components with a limited performance, unlike the computer. 따라서, 셋톱박스 애플리케이션에서 로그 생 성은 극히 제한되어 있는데, 초기 셋톱박스가 주로 소용량의 메모리를 탑재하고 있기 때문에 셋톱박스에서 로그를 저장하기 위한 영역이 하드웨어적으로 극히 제한될 수 밖에 없다. Accordingly, there is generated log castle extremely limited in the set-top box application, not only can an area for storing the log in the set top box because the initial set-top box is mainly that, equipped with a small capacity of the memory is extremely limited by hardware. 물론 셋톱박스를 이용하는 이용자의 액션 로그를 메모리에 저장할 수도 있지만, 이런 경우 셋톱박스 단가를 상승시키기 때문에 어려운 상황이었다. Of course, there are the user's action log using a set-top box can store in memory, in this case it was a difficult situation because it increases the cost set-top boxes. 이런 이유로 셋톱박스 내의 고객의 액션 로그를 생성/수집/분석하는 체계는 거의 이루어져 있지 않고 있고 있다. For this reason, systems that generate / collect / analyze the customer's set-top box in the action log and does not have nearly made up. 도 1은 종래의 셋톱박스 로그 저장을 위한 소프트웨어 구성을 나타내는 블록도이다. 1 is a block diagram showing a software configuration for a conventional set-top box log storage. 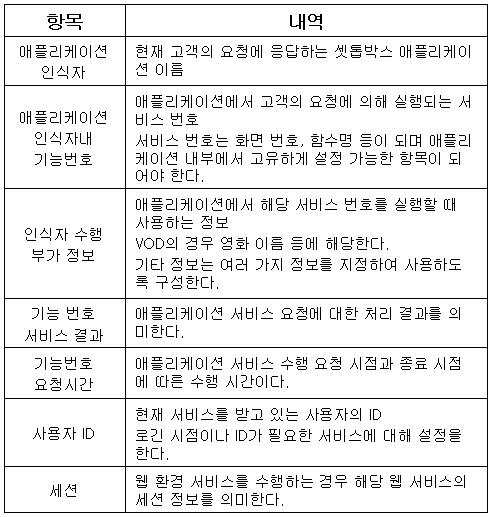 도 1을 참조하면, 셋톱박스 소프트웨어는 크게 운영체제와 장치 드라이버(10), 미들웨어(20), 애플리케이션(30)으로 나누어진다. 1, the set-top box software largely divided into the operating system and the device driver 10, middleware 20, an application 30. 장치 드라이버는 대개 사용하는 칩에 따라 선정되고, 운영체제는 셋톱박스 제조사의 선호도에 따라 선정하며, 미들웨어(20)와 애플리케이션(30)은 케이블 서비스에 따라 선정된다. Device drivers are selected based on the chip usually used, the operating system and selected according to the preferences of the set-top box manufacturers, middleware 20 and the application 30 is selected according to the cable service. 셋톱박스에서 장치 드라이버의 로그 방식과 인터페이스는 칩 제조사가 정한 형식이 사용되고, 운영체제의 로그 방식과 인터페이스는 선정된 운영체제에서 정해진 형식이 사용되며, 미들웨어(20)와 애플리케이션(30)에서 로그 방식과 인터페이스는 미들웨어(20)에서 정한 형식이 사용된다. Log system in the set-top box device driver and interface chip manufacturer is the format used set, the operating system logs the way the interface is defined format is used in the selection of operating systems, middleware (20) and application (30) in the log system and interface the format is specified in the middleware 20 is used. 따라서, 각 소프트웨어 모듈은 상위 소프트웨어 모듈에 대하여 로그 정보 접속 인터페이스를 제공하게 되어 있다. Thus, each software module is to provide the log information with respect to the upper connection interface software module. 즉, 상위의 소프트웨어 모듈일수록 많은 로그 정보를 접속할 수 있는 구성이다. That is, a configuration capable of connecting a number of log information, the more the top of the software module. 미국 등록특허 제5964839호는 최소 한 개 이상의 장치와 컴퓨터 사이에 데이 터 접속 통신 부속장치를 포함한 컴퓨터로 이루어진 정보 감시와 수집 시스템에 관한 것으로, 데스크톱에서 상기 데스크톱 동작 활동과 운영체제 모뎀의 접속성에 관한 데이터의 수집과 기록을 목적으로 하는 실행 파일과 가상 장치를 포함한 데스크톱 응용 프로그램들이 하나의 클라이언트 집합으로 테스크톱의 활동과 접속에 관해 모니터링하는 것이다. Data concerning gender U.S. Patent No. 5,964,839 discloses at least one or more devices and the data connection to the connection of the desktop operating activities and operating a modem on a desktop of communication in the information monitoring and collection system consisting of a computer, including the accessory device to each computer Desktop applications, including executable files and virtual devices for the purpose of gathering and recording of their activities will be monitored on the connection of the top tasks in one set of clients. 또한, 대한민국 공개특허 제10-2004-37490호는 셋톱박스의 모든 시스템에 개별적으로 이벤트 로그 API(Application Program Interface)를 제공하고, 해당 이벤트 로그 API에서 발생한 로그 이벤트를 처리하기 위한 이벤트 로그 엔진을 별도로 구성하는 것이다. In addition, the Republic of Korea Patent Publication No. 10-2004-37490 provides an individual event log (Application Program Interface) API for all system of set-top boxes, and the event log processing engine to log events from the event log API separately to construct. 그러나 상기와 같은 종래의 셋톱박스는 매우 제약적인 하드웨어 구성을 가지기 때문에 이벤트 로그 엔진에 의한 콜백 이벤트를 구성하는 것은 셋톱박스의 성능 문제를 야기할 수 있다. However, conventional set-top box as described above is to configure a callback events by the event log engine because it has a very constrained hardware configuration can cause performance problems in the set-top box. 또한, 셋톱박스 이용자의 실제 액션 로그를 저장하는 방법을 제시하지 않고, 일반적인 로그 생성에 관한 것을 셋톱박스에 적용한 것으로 셋톱박스 고유 환경중 다양하게 개발되고 있는 개별 애플리케이션마다의 API를 계속 개발해야 되는 등의 셋톱박스 애플리케이션의 고유 특성을 고려하지 않고 있어 계속적으로 발전하고 있는 디지털 TV 서비스를 고려하지 않고 있는 문제점이 있었다. In addition, the set-top box does not provide a way to store the actual action log of the users, that's about a general log generated by applying a set-top box which should continue to develop the set-top box API for each individual application being variously developed in a unique environment, it's without taking into account the unique characteristics of the set-top box applications, there is a problem that does not take into account the digital TV services and develop continuously. 따라서, 본 발명은 상기와 같은 종래 기술의 제반 단점과 문제점을 해결하기 위한 것으로, 셋톱박스 액션 로그를 생성하기 위해 셋톱박스 애플리케이션 로그 플 러그인을 통해 셋톱박스 액션 로그 생성 여부를 셋톱박스 이용자의 허용 여부에 따라 생성하고, 셋톱박스 애플리케이션 로그 플러그인 구동부에서 생성할 로그의 형태를 제어 및 개별 셋톱박스에 생성된 액션 로그를 수집하고 분석할 수 있는 셋톱박스 액션 로그 시스템 및 액션 로그 생성 방법을 제공함에 본 발명의 목적이 있다. Accordingly, the invention is a set-top box application log plug-in set-top box action log generated if the tolerance of the set-top box user through that for solving the various disadvantages and problems of the prior art, to produce a set-top box action log, such as the generated according to whether or not, and the set-top box application log plug control the shape of the logs to be generated by the drive section, and collecting the action log generated in a separate set-top box and generates a set-top box action log systems, and action log to analyze how to provide the purpose of the invention. 본 발명의 상기 목적과 기술적 구성 및 그에 따른 작용효과에 관한 자세한 사항은 본 발명의 바람직한 실시예를 도시하고 있는 도면을 참조한 이하 상세한 설명에 의해 보다 명확하게 이해될 것이다. For details on the purpose, technical configuration, and operational effects thereof according to the present invention it will be clearly understood by the following detailed description with reference to the drawing illustrating a preferred embodiment of the present invention. 도 2는 본 발명에 따른 셋톱박스 액션 로그 시스템을 나타내는 구성도이다. 2 is a block diagram showing a set-top box action log The system according to the present invention. 도 2에 도시된 바와 같이, 셋톱박스 액션 로그 시스템은 크게 셋톱박스(100), 셋톱박스 이용자의 액션 로그를 수집하기 위한 셋톱박스 액션 로그 수집 서버(110), 수집된 정보를 저장하기 위한 데이터베이스(120), 셋톱박스 조작장치(130)로 구성되어 있다. 2, the set-top box action log system database to greatly save the set-top box 100, set top box action log collecting server 110, the information gathered for collecting the action log of the set-top box user ( 120), it consists of a set-top box control device (130). 셋톱박스(100)는 현재 셋톱박스(100)에 접속하여 이용하는 셋톱박스 애플리케이션(140)에서 셋톱박스 액션 로그(150)를 생성하기 위해 셋톱박스 애플리케이션(140)에 장착되는 셋톱박스 애플리케이션 플러그인 구동부(145)와 상기 셋톱박스 애플리케이션 플러그인 구동부(145)에서 생성한 로그가 셋톱박스(100)에 저장된 형태의 셋톱박스 액션 로그(150)로 구성된다. Set-top box 100 includes a set-top box application plug-in drive section (145 which is mounted on the set-top box application 140 to generate a set-top box action log 150 from the set-top box application 140 is used by the current connection to the set-top box 100, ) and the set-top box application that logs generated by the plug driver 145 is configured as a set-top box (in the form of a set-top box action log 150 stored in 100). 또한, 셋톱박스 애플리케이션 플러그인 구동부(145)에서 생성된 셋톱박스 액션 로그(150)는 셋톱박스 액션 로그 전송 구동부(155)에 의해 셋톱박스 액션 로그 수집 서버(110)로 전송된다. In addition, the set-top box action log 150 generated by the set-top box application plug driver 145 is transmitted to the set-top box action log collecting server 110 by the set-top box transmitting driving action log 155. The 셋톱박스 액션 로그 수집 서버(110)에는 셋톱박스(100)에서 전송된 셋톱박스 액션 로그(150)를 데이터베이스(120)에 저장하기 위해 셋톱박스 액션 로그 수집 구동부(180)를 구성한다. Set-top boxes action log collecting server 110 constitutes a set-top box action log collection drive unit 180 to store the set-top box action log 150, transmitted from the set-top box 100 to the database 120. 또한 셋톱박스(100)의 셋톱박스 액션 로그 정책 설정부(160)의 정보를 설정하기 위해 셋톱박스 액션 로그 수집 서 버(110) 내에 셋톱박스 액션 로그 정책 구동부(185)를 구성한다. Also configure the set-top box action log policy driver 185 in the server 110, set-top boxes standing log collection actions to set the information of the set-top box 100, set top box action log policy setting unit 160 of. 도 3은 본 발명에 따른 셋톱박스 액션 로그 생성 방법을 나타내는 흐름도이다. Figure 3 is a flow diagram illustrating a set-top box generates action log The process according to the invention. 도 3을 참조하면, 셋톱박스를 사용하는 이용자가 셋톱박스 조작장치의 셋톱박스 조작부를 통해 조작하고(S100), 상기 셋톱박스에서는 해당 조작장치에 필요한 셋톱박스 애플리케이션이 동작한다(S110). 3, the user is to use the set-top box operated by a set-top box control panel on the set-top box, and an operating device (S100), in the set-top box and the set-top box application required for the operation control device (S110). 그후, 해당 셋톱박스 애플리케이션은 셋톱박스 애플리케이션 플러그인 구동부를 호출한다(S120). Thereafter, the set-top box application calls a set-top box application plug-driving (S120). 셋톱박스 애플리케이션에서 셋톱박스 애플리케이션 플러그인 구동부 호출을 시도할 때, 셋톱박스 액션 로그에 필요한 데이터를 전달한다. When you try to call driver Plug-in set-top box applications in set-top box applications, and delivers the data required for the set-top box, the action log. 셋톱박스 애플리케이션으로 부터 셋톱박스 애플리케이션 플러그인 구동부에 전달하는 데이터 형식은 표 1을 이용하며, 필요에 따라 더 추가될 수 있다. Set-top boxes from application data types to transfer a set-top box application plug-in drive is used in Table 1, and can further be added as needed. 상기 표 1은 셋톱박스 애플리케이션에서 셋톱박스 애플리케이션 플러그인 구동부를 호출할 때 기본적으로 전달되는 항목이다. Table 1 is an item that is basically passed when calling the set-top box application plug driver in the set-top box applications. 해당 항목 중 애플리케이션 인식자는 셋톱박스 애플리케이션의 고유한 이름으로 셋톱박스를 만들때 이름들이 결정된다. The recognition of this item applications to create a set-top box with a unique name, the name of the set-top box applications are determined. 애플리케이션 인식자 내 기능번호는 셋톱박스 조작부로 부터 전달된 처리를 하기 위해 존재하는 셋톱박스 애플리케이션내 세부 기능으로 화면 번호 또는 함수 등이 해당된다. Application-aware functions within the party number two set-top box applications refine features to the screen number or function that is present to handle the delivery from the set-top box control panel. 인식자 수행 부가 정보는 해당 항목은 셋톱박스 애플리케이션내 기능 번호를 호출할 때 사용하는 정보로써 VOD 서비스를 받을 경우 해당 VOD 이름, VOD 파일의 위치 등에 해당한다. Perform additional identifier information, such as that the item is placed in the name of its VOD, VOD VOD files if you receive the services with information that is used to call my function number set-top box applications. 상기 표 2는 셋톱박스를 사용하는 이용자에 대한 셋톱박스 액션 로그를 생성할 때 프라이버시 문제가 될 수 있는 항목을 설정한 것으로, 전체 셋톱박스 액션 로그를 생성할 것인지 여부를 저장하는 것과 특히 시청률 조사에서 필요하기는 하지만 이용자의 프라이버시 문제를 야기할 수 있는 채널 선택 정보에 대한 생성 여부를 저장한다. Table 2 is a set that can be a privacy issue when creating the set-top box action log for the user to use the set-top boxes, as storage whether or not to generate a full set-top box action log particularly in audience measurement need to, but stores the generated whether the user selected channel information, which may cause a problem of privacy. 상기 표 3은 로그 생성/전송 정책 데이터에 대한 상세 내역으로 셋톱박스 애플리케이션 플러그인 구동부에서 상기 도 2의 S140, S160, S180 단계를 실행할 때도 필요한 로그 생성/전송 정책 데이터를 저장한다. Table 3 stores the log generation / transmission policy in the set-top box application plug driving the details of the data of FIG. 2 S140, S160, the log generation / transmission policy data that is required when running the step S180. 만약 로그 생성 정책 데이터에 셋톱박스 애플리케이션 플러그인 구동부로 부터 전송된 데이터에 적합하지 않으면 셋톱박스 애플리케이션 플러그인 호출을 종료하고(S190), 로그 생성/전송 정책 데이터에 셋톱박스 애플리케이션 플러그인 구동부로 부터 전송된 데이터에 적합한 경우 셋톱박스 애플리케이션 플러그인 구동부는 현재 저장된 셋톱박스 액션 로그의 데이터 용량을 확인한다(S150). If the logs created policy data in not suitable for data transmission from the set-top box application plug-driver in a set-top box data transmitted from the exit from the application plug-in calls and (S190), the log generation / transmission policy data to the set-top box application plug-driving If the set-top box suitable for application plug-in driver confirms the data currently stored in the set-top box capacity action log (S150). 상기 셋톱박스 액션 로그의 데이터 용량과 로그 생성/전송 정책 데이터에서 정의된 용량을 비교한다(S160). It compares the capacity defined in the data volume and the log generation / transmission policy data of the set-top box action log (S160). 만약, 상기 확인한 데이터 용량과 로그 생성 정책 데이터에서 확인한 데이터 용량이 초과하면 셋톱박스 애플리케이션 플러그인 구동부에서는 신규로 요청된 셋톱박스 액션 로그를 저장하기 위해 기존의 과거 데이터를 삭제한(S170) 후, 데이터를 저장하며(S180), 데이터 용량이 초과하지 않으면 셋톱박스 애플리케이션으로 요청된 셋톱박스 액션 로그에 대한 데이터를 저장한다(S180). If, when the data volume exceeding identified in the check bytes of data and log generation policy data after (S170) erases the existing history data, to store the set-top box application plug driving a set top box action log request to the new, the data and storage (S180), unless the data exceed the capacity to store data for the set-top box application, the set-top box to the action log request (S180). 상기 데이터 저장시 저장 항목은 표 4를 이용하며, 필요에 따라 더 추가될 수 있다. The data stored in storage items, and using the Table 4, it may be further added, if necessary. 상기 표 4는 셋톱박스 애플리케이션 플러그인 구동부에서 셋톱박스 애플리케이션에서 호출된 항목을 포함하여 셋톱박스 액션 로그를 생성할 때의 기본적으로 생성되는 항목이다. Table 4 shows a entry is generated by default at the time of generating a set-top box action log, including the items in the call set-top box application on a set-top box application plug-in driver. 해당 항목은 셋톱박스 애플리케이션 플러그인 구동부의 변경에 따라 달라질 수 있지만 기본적인 항목은 상기 표 4의 항목에 추가되는 형태로 구성된다. Item, but may vary depending on change of the set-top box application plug driving the basic entry is of a type that is added to entries in the Table 4 below. 상기 데이터를 저장한 후, 셋톱박스 애플리케이션 플러그인 구동부는 호출을 종료하고(S190), 셋톱박스 애플리케이션의 동작이 종료되며(S200), 셋톱박스를 사용하는 이용자는 셋톱박스 조작을 대기한다(S210). After storing the data, the set-top box application plug driver ends the call, and (S190), and ends the operation of the set-top box application (S200), the user to use the set-top box must wait for a set-top box operation (S210). 도 5는 본 발명에 따른 로그 생성 정책 전송을 나타내는 흐름도이다. Figure 5 is a flow diagram illustrating a log generation policy transmitted in accordance with the present invention. 도 5를 참조하면, 셋톱박스 액션 로그 정책 설정부는 일단위 또는 특정 설정된 주기로 셋톱박스 액션 로그 정책 구동부에 접속하여(S400), 정상 접속 여부를 판단한다(S410). Referring to Figure 5, (S400) by accessing the set-top box action log policy setting unit one unit or set-top box action log policy specific driving cycle is set, it is determined whether or not a normal connection (S410). 접속이 정상적으로 않되면 종료하고, 접속이 정상적으로 되면 정책 변경 여부를 확인한다(S420). Once when the connection is not properly shut down, and the connection is properly Check whether the policy change (S420). 만약, 정책이 변경되면 셋톱박스 로그 생성 정책을 변경하고(S430), 정책이 변경이 되지 않으면 셋톱박스 로그 생성 정책을 변경하지 않는다. If, once the policy change and policy change created a set-top box log (S430), if the policy is not changed it does not change the set-top box logs generated policy. 만약, 접속에 실패하면 셋톱박스 액션 로그 전송 구동부를 종료하고, 접속에 성공하면 셋톱박스 액션 로그 수집 구동부에 로그를 전송한다(S520). If and when the connection fails exit the set-top box transmits driving action log and send the log After a successful connection to the set-top box log collection action driving (S520). 이때, 전송에 실패하면 셋톱박스 액션 로그 수집 구동부를 종료하고, 전송에 성공하면 셋톱박스 액션 로그를 제거한다(S540). At this time, if you fail to exit the set-top box transmits the action log collection drive, and if the transfer is successful, removing the set-top box logs the action (S540). 본 발명은 이상에서 살펴본 바와 같이 바람직한 실시예를 들어 도시하고 설명하였으나, 상기한 실시예에 한정되지 아니하며 본 발명의 정신을 벗어나지 않는 범위 내에서 당해 발명이 속하는 기술분야에서 통상의 지식을 가진 자에 의해 다양한 변경과 수정이 가능할 것이다. A person present invention with a preferred embodiment example of skill in the belonging to this but shown and described, the art at without departing from the spirit of the invention shall not be limited to the above-described embodiment the range invention art As described above various changes and modifications will be possible by. 를 포함하여 구성됨을 특징으로 하는 셋톱박스 액션 로그 시스템. Set-top box system logs the action that features configured to include a. 상기 셋톱박스 애플리케이션 플러그인 구동부에서 셋톱박스 액션 로그를 생성하기 위해 셋톱박스를 사용하는 이용자가 셋톱박스를 조작할 수 있는 셋톱박스 조작부로 구성된 셋톱박스 조작장치를 더 포함하여 구성됨을 특징으로 하는 셋톱박스 액션 로그 시스템. Set-top boxes, characterized in that the user, at the set-top box application plug-in driver using a set-top box to generate a set-top box action log configured to further include a set-top box control device consisting of a set-top box control panel to operate the set-top box Action log system. 를 포함하여 이루어짐을 특징으로 하는 셋톱박스 액션 로그 생성 방법. The set-top box action log generation method characterized by including yirueojim. 상기 (d) 단계는 로그 생성/전송 정책 데이터에 셋톱박스 애플리케이션 플러그인 구동부로 부터 전송된 데이터에 적합한 경우에 (e) 단계로 넘어가고, 로그 생성/전송 정책 데이터에 셋톱박스 애플리케이션 플러그인 구동부로 부터 전송된 데이터에 적합하지 않으면 셋톱박스 애플리케이션 플러그인 구동부 호출을 종료하는 것을 특징으로 하는 셋톱박스 액션 로그 생성 방법. The step (d) is a log generation / transmission policy, if data in an appropriate data transmitted from the set-top box application plug driver goes to the step (e), the log generation / transmission transmitted from the set-top box application plug-in driver in the policy data If you do not fit into the set-top box, the set-top box data log generated action wherein you exit the application plug-driving calls. 상기 (ⅰ) 단계는 셋톱박스 액션 로그의 데이터 용량과 로그 생성 정책 데이터에서 확인한 데이터 용량이 초과하면 (ⅱ) 단계로 넘어가고, 확인한 데이터 용량과 로그 생성 정책 데이터에서 확인한 데이터 용량이 초과하지 않으면 (ⅲ) 단계로 넘어가는 것을 특징으로 하는 셋톱박스 액션 로그 생성 방법. The (ⅰ) steps if the set-top box when the data capacity of the action log and the log generated by the policy data data capacity is more than checking in goes to (ⅱ) phase, confirming the data capacity and data capacity identified in the logs created policy data does not exceed ( set-top boxes action log generation method, characterized in that the go to ⅲ) step. 상기 (ⅱ) 단계는 해당 화면이 셋톱박스 로그 수집 인증/정보 화면에 해당한 경우 (ⅲ) 단계로 넘어가고, 해당 화면이 셋톱박스 로그 수집 인증/정보 화면에 해당하지 않은 경우 종료되는 것을 특징으로 하는 셋톱박스 액션 로그 생성 방법. The (ⅱ) step is characterized in that the screen is turned over to the (ⅲ) step if a corresponds to the set-top box log collection authentication / information screen, end when the screen is not available for the set-top box log collection authentication / information screen how to create a set-top box logs the action. 상기 (ⅳ) 단계는 정보 설정이 변경되면 (ⅴ) 단계로 넘어가고, 정보 설정이 변경되지 않으면 종료되는 것을 특징으로 하는 셋톱박스 액션 로그 생성 방법. The (ⅳ) step goes to (ⅴ) step as the information setting is changed, the set-top box action log generation method characterized in that the end if the setting information is not changed. 상기 (ⅰ) 단계는 접속이 정상이면 (ⅱ) 단계로 넘어가고, 접속이 정상적으로 않되면 종료되는 것을 특징으로 하는 셋톱박스 액션 로그 생성 방법. The (ⅰ) step is turned over to the back connection is normal (ⅱ) step, a set-top box action log generation method characterized in that the end when not connected normally. 상기 (ⅱ)단계는 정책이 변경되면 (ⅲ) 단계로 넘어가고, 정책이 변경되지 않으면 종료되는 것을 특징으로 하는 셋톱박스 액션 로그 생성 방법. The (ⅱ) step is a set-top box action log generation method characterized in that when a policy changes goes to (ⅲ) step, an end if the policy is not changed.